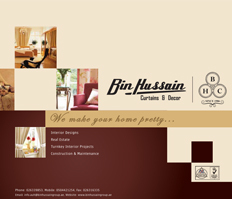 ..:: Bin Hussain Curtains & Décor ::..
Bin Hussain Curtains & Decor is an U.A.E based interior designer’s having a niche for itself in the aesthetic field of interior designing since 1986, with an accustomed experience of 30 years in interior solutions such as in curtain making, carpet fixing, sofa and upholstery works painting and wallpaper etc in and around U.A.E. More than 70 efficient and expert staff brings out their expertise and creativity to satisfy the very needs and desires of each customers with total dedication and commitment. We are very much focusing on customer satisfaction, which we consider as our prime and ultimate objective and our works in this creative realm has been valued by our satisfied customers through out U.A.E. Specialists in curtain designing and curtain fabric and accessories, sofa Upholstery, carpet and tiles, Blinds, wall paper and wall covering and soft furnishings. Having own team of skilled technicians providing instant and better service to our valued clients for impressive installation and fittings. Our mission is to offer our customers high level of service that exceeds their requirements and expectations. We are planning to open our branches throughout UAE for serving the entire people of UAE. At present we have 3 branches, one of them located at Abu Dhabi, other one located in Dubai and one in India. P.O.Box: 6748 Abu Dhabi- United Arab Emirates.